Complete your stay in Thailand with a visit to the splendid Khao Kheow Open Safari, where you can also find our Bangkok and Pattaya tours. You may have understandably been confused by different spellings for this park. Alternate western spellings are Khao Kheeo, Khao Kaeo, Khao Khieo and Khao Kheo. (Welcome to Thailand!) But rest assured, these all refer to the same place. 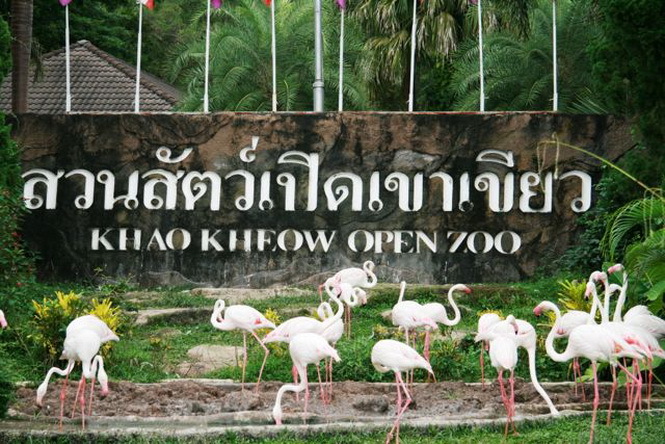 Conveniently located in Chonburi province, just 1 hour from Bangkok and 90 minutes from Pattaya, Khao Kheow Open Zoo is ready to unleash your wild-side. Filled with over 300 species and 8000+ animals, this 2000-acre wildlife sanctuary guarantees fun and entertainment - ideal for the entire family! Whether you want to have an up-close-and-personal encounter with some of the world's wildest creatures or simply experience the spectacular jungle, Khao Kheow Open Safari can make these thrilling events come to life-and much more! Here are some of the must-see highlights of your Khao Kheow Open Safari tour:. Perfect for visitors who want to veer away from driving, tram rides offer a relaxing and convenient way to travel around the zoo's different facilities. Free and highly recommended, tram rides stop at every station so you can watch the animal shows in the area. You can then catch the next tram to each station as you please. Amusing and enriching, Journey to the Jungle is an educational program showcasing various animals and birds in their natural habitats. Feast your eyes and be captivated as you see wild cats climb trees and hop between logs or birds soar high and display their amazing talents. Meet and greet countless species of exotic animals as they teach you about their habitats and lifestyle. You will even learn some interesting tips and tricks about nature conservation and recycling, ensuring the animal kingdom stays healthy for generations to come. Do not miss the exciting photo shoots after every Wild Khao Kheeo presentation. Enjoy a short ride on the largest land animal on the continent, the Asian Elephant! These domesticated, gentle giants will take you through the zoo's hilly terrain and take your breath away. You can also stop by the elephant area to simply watch the elephants show off their impressive skills. As soon as the vanilla sky turns purple, get ready for the exciting Night Safari to observe animals, such as tapirs, elephants, giraffes, llamas, emus and numerous bird species. Fear not the night because you will be boarding a modern and safe service car and escorted by an expert tour guide throughout the expedition. Flight of the Gibbon ™ Zipline Tours. The latest addition to Khao Kheow Open Safari, Flight of the Gibbon will satiate your voracious hunger for adventure! Swing a la Tarzan through the vast, picturesque rainforest via wire ziplines, the largest and highest canopy zip-line tour in the world! Built and designed with awesome fun and ultra safety in mind, Flight of the Gibbon is suitable for children and adults alike. Not to forget, Trip Advisor featured Flight of the Gibbon as one of the most recommended things to do in Thailand. Tours include free pick-up and drop-off in Bangkok and Pattaya. -Children price height between 90-135 cms.